NOTE: Last update December 2018. This website is constantly updated as new information becomes available. 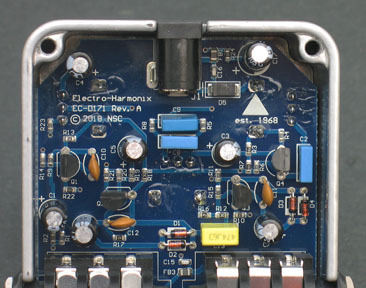 Version, Edition, and Revision numbers listed here are not actual Electro-Harmonix identifiers. They are my categorizations, for identification purposes only. Permission required to repost any information from this site in any ebay listing. Website and contents ©Kit Rae. 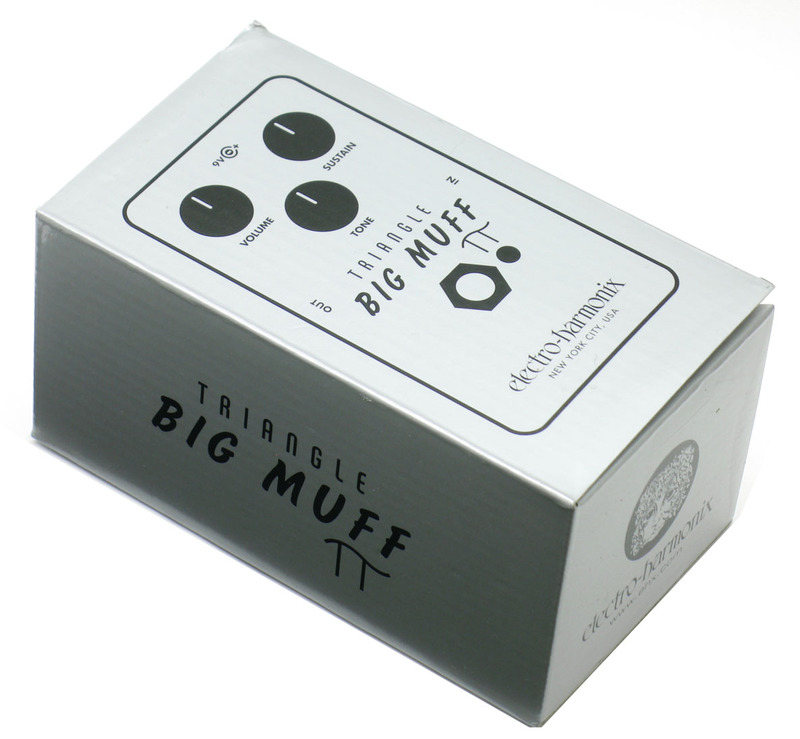 THE LEGENDARY SANTANA TRIANGLE BIG MUFF - Alhough often associated with the Big Muff in Electro-Harmonix advertising, it is unknown if guitarist Carlos Santana ever actually recorded with one. 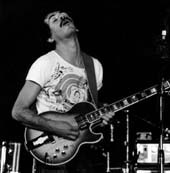 Santana's well known, super-sustained and smooth distortion tone on his early records reportedly came from an early P-90 or humbucker equipped Les Paul played into a Fender Twin Reverb at high volume. He also later used a Randall Smith modded tweed Fender Bassman amp mounted inside a Fender Princeton cab with a 12" speaker, nicknamed the "Princeton Boogie". Smith made around 100 of these modded Fenders, and eventually developed this mod into the Mesa Boogie Mark I amps Santana later became associated with. Santana also used other amps in the late 60's and early 70's, even solid state amps. His tone came from these clean amps, high volume, and natural speaker compression and sustain. 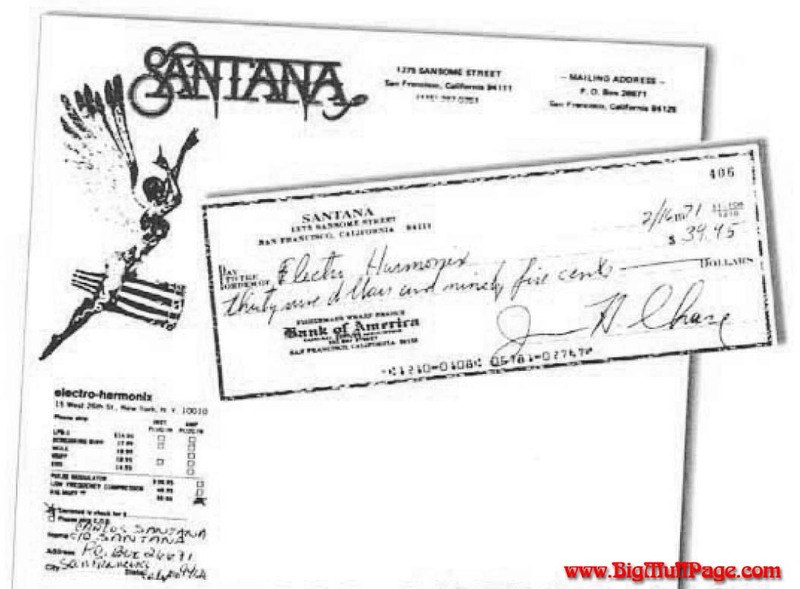 It is documented that Santana purchased a V1 Triangle Big Muff in February 1971. It was possibly used on the Santana (aka Santana III) album released later in 1971. Santana may have also used a Big Muff on some tracks from Abraxas, his previous album, recorded in 1970. Several of those solos sound exactly like a Big Muff through a Fender amp. Using a P-90 equipped Les Paul set to the middle position, an early triangle Big Muff (sustain set about 30%, tone about 50%), and a clean Fender Twin Reverb at high volume (just to the point of feedback) you can recreate nearly the exact tone heard in Santana's cover of Black Magic Woman. A similar tone can also be created by turning the Twin volume all the way up until the sound starts to break a little, but that is deafening, and does not sound as close as using the Big Muff in my opionion. Until Santana ever speaks of or documents using a Big Muff, we will never know, but what is known as the Santana signature tone from throughout his later career is certainly not a Big Muff pedal. The only pedal Santana has consistantly used is a wah pedal. 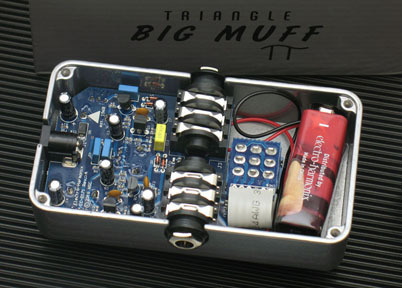 PINK FLOYD / DAVID GILMOUR TRIANGLE BIG MUFF - Although it is unknown if guitarist David Gilmour ever used a Triangle Big Muff for any Pink Floyd recordings, a Triangle BMP was seen on top of his Pete Cornish-made, all-tube board in 2006 On and Island rehearsal and on later dates of the tour. 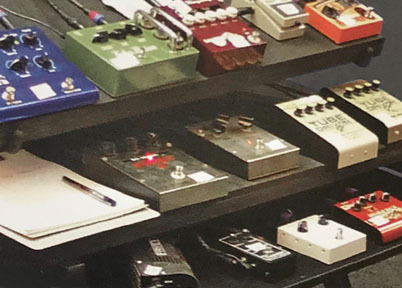 One has also been seen on a testing pedal board in 2011 and a pedal board in his Medina studio in 2017. 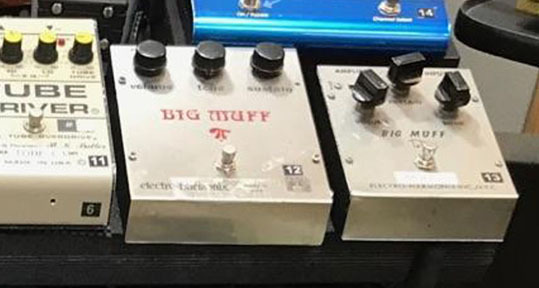 Gilmour's primary Big Muff was the V2 Ram's Head version. 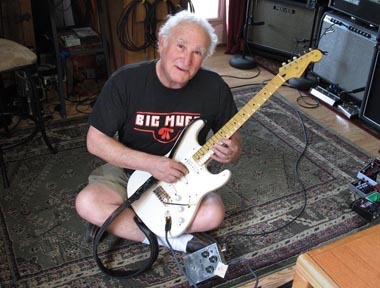 You can read about Gilmour's various Big Muffs here. Power Supply: 9-Volt battery or optional 9V power supply from Electro-Harmonix, 9.6DC-200BI (same as used by Boss™ & Ibanez™) 9.6 Volts DC, or other AC adapters capable of delivering at least 30mA. Your original pi. In October 2018 Electro-Harmonix continued with their line of nano sized Big Muff reissues (following the Green Russian and Op-Amp) and released the Triangle Big Muff. It was the perfect time to release this reissue, as 2018 was the 50th anniversary of the founding of Electro-Harmonix. 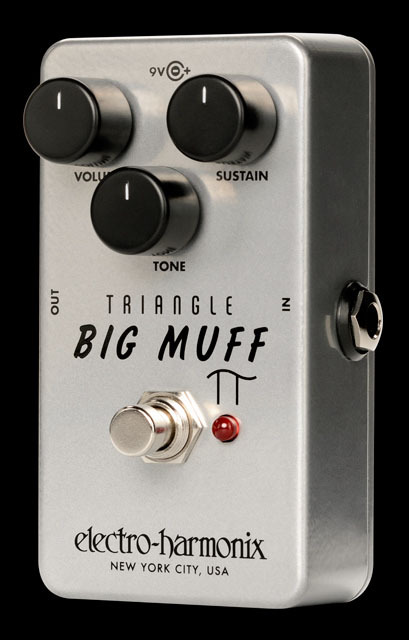 If any pedal could be said to be the flagship of that company, it was the Big Muff Pi. As the promotional copy stated, it was "A re-creation of the original and dripping with vintage Electro-Harmonix DNA and tone. 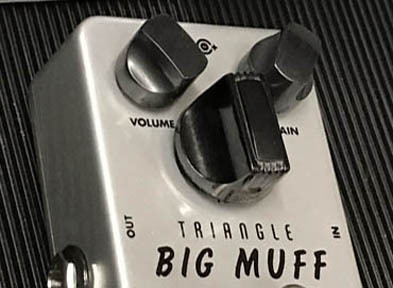 Dubbed the Triangle Big Muff because of the layout of its Volume, Sustain and Tone controls, this is the one that started it all circa 1969." 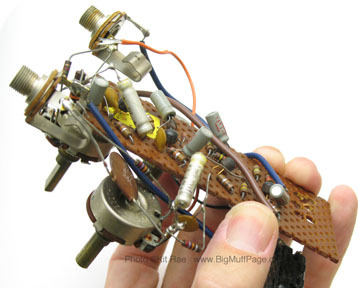 There were many circuit variants inside the V1 Big Muffs, and a wide variety of different sounds among them. It's impossible to make 'one' reissue that sounds like all of them (although the Deluxe Big Muff almost does! ), but EHX successflly captured the sound of a few of the more common V1 circuit variants with the reissue. In so doing, EHX recaptured a key piece of their heritage from the clone builders, and at a price that is difficult to compete with. 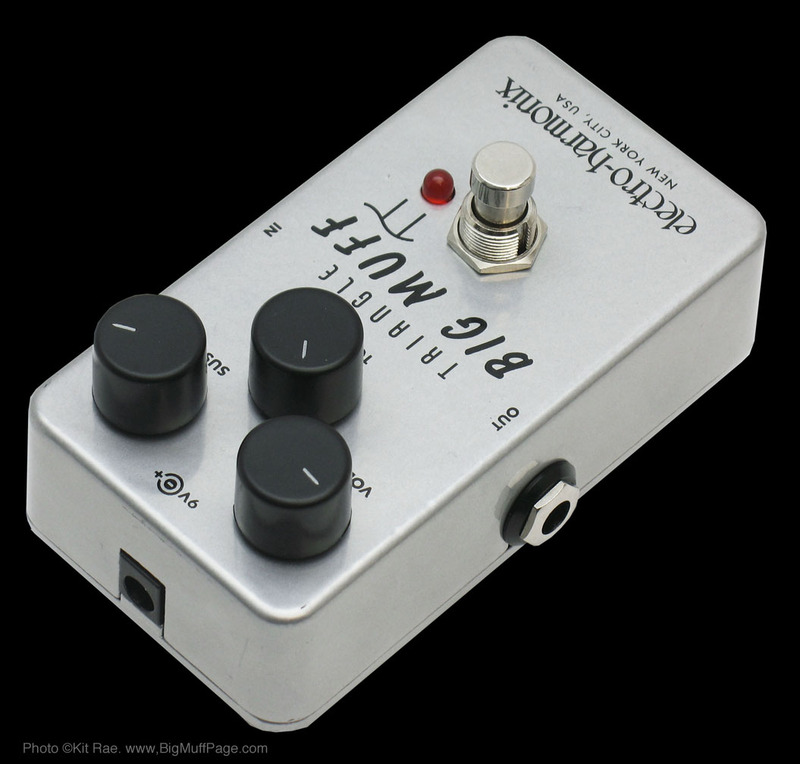 This was technically the 5th reissue of the Big Muff, although many people seem unaware of that fact. The original Electro-Harmonix company based in New York went out of business in 1984. When New Sensor resurrected EHX under the Sovtek brand in the 1990s the first pedal reissued was a Big Muff. 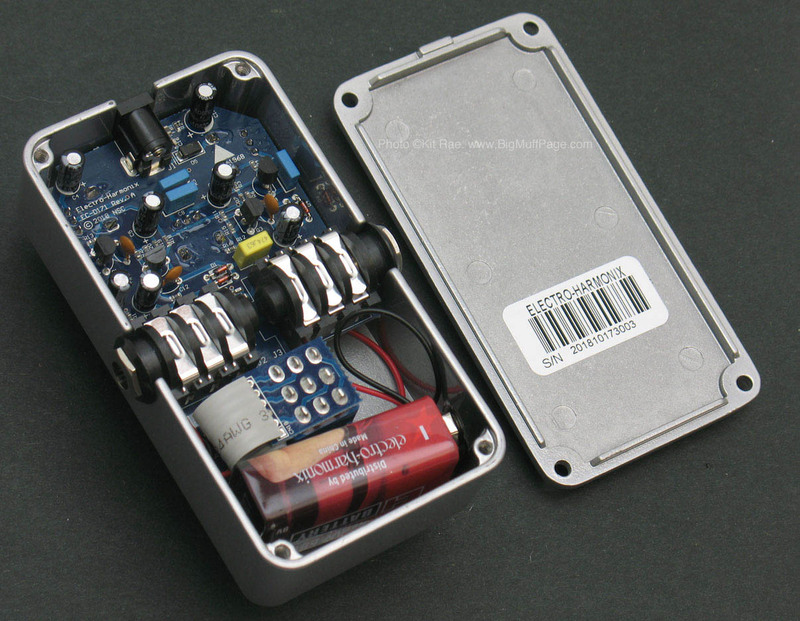 Then in 2000 EHX reissued it again in the same type of enclosure as the last NYC version from 1984. In 2017 the "Green Russian" version of the Sovtek Big Muff was reissued, then the Op-Amp and Triangle reissues followed in 2018. DEVELOPMENT - The very early 1969-1970 Big Muffs with the perf board circuits have always been EHX owner Mike Matthews' favorites, so the reissue research started with those. Electro-Harmonix has always been focused on new and innovative ideas. 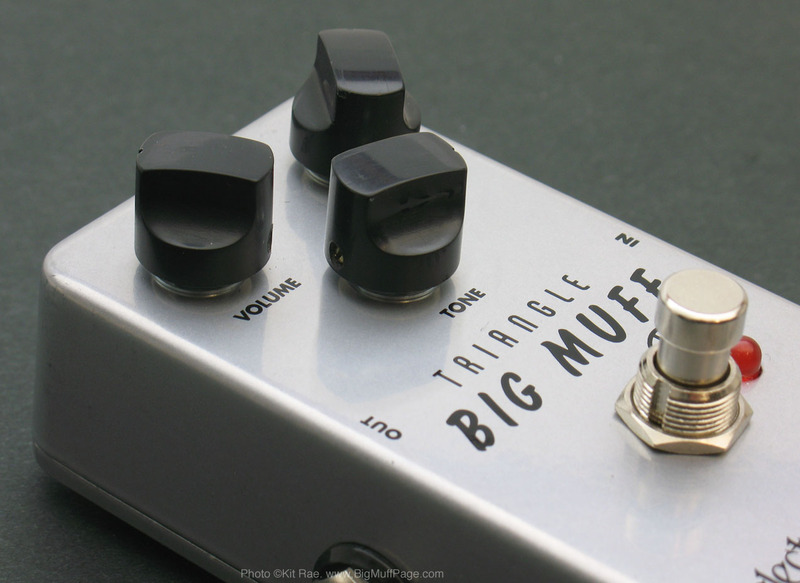 As such, they have not dwelled in the past or kept examples of every vintage version of the Big Muff, especially the very rare perfboard Triangle Big Muffs. 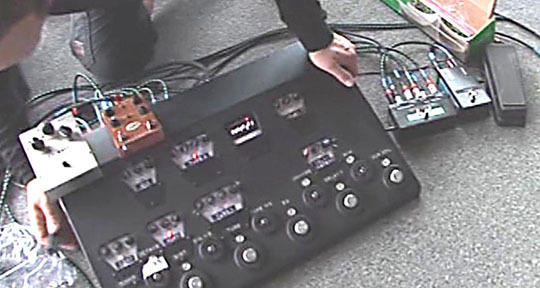 EHX relies on friends and collectors to loan them vintage units to examine and dissect. In 2015 Mike came by my little studio to test three originals from my collection. Mike is a keyboardist, not a guitarist, but he can fret and pick strings. He would pick a note and listen to the sound and how it sustained. There was a specific sound that he remembered and he almost immediately picked out the one that had it. Testing went on for some time among the three, but Mike kept going back to that specific V1. The perfboard V1 Mike liked was a very rare circuit varaint with some unique differences not found on any other V1s that followed. 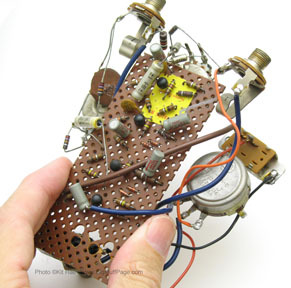 EHX also had another rare vintage V1 from around 1970 that was used for research and development. It was also an early unit, and probably the first circuit variant that was ever made on a printed circuit board (PCB). This PCB had the first version of the circuit trace, which required a jumper wire to be soldered on the trace side of the board. The trace was later updated to eliminate the need for the jumper sometime in 1970, so all later V1s used a revised PCB. board with some off-board point-to-point wiring. 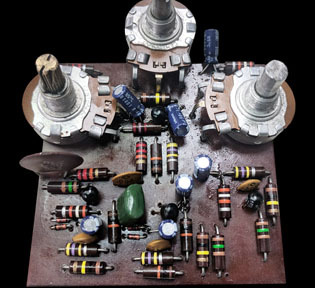 Perfboard is usually used for prototyping electronic circuits, but the very early V1 Big Muffs were hand-made this way. The one on the right was from later production after the change to a printed citcuit board (PCB), and was probably the first V1 circuit variant ever made on a PCB. "Videos are a huge help...especially the one showing all the different Triangle variants. People will understand that there isn’t a singular one but hopefully the reissue captures the overall vibe. The real problem with comparison videos, especially with Big Muffs, is that the user doesn’t get to feel the differences, and I think that’s the biggest thing with the Big Muff variants. Yes, side-by-side the Green Russian, Op-Amp, and Triangle will certainly sound different from each other in a comparison, but the truth is they all pretty much sound the same, from a macro point of view, because they’re all Big Muffs. It’s when you’re the one actually playing through them that you can feel how truly different their characteristics are. They can respond differently and drive the mood of the music differently. Highs, mids, bottom end… All of those differences are perceivable for sure, but things like tightness, airiness, crunch, response, bite, life… All of those things you have to feel for yourself. That’s the biggest message I want to get across for people to understand the differences." 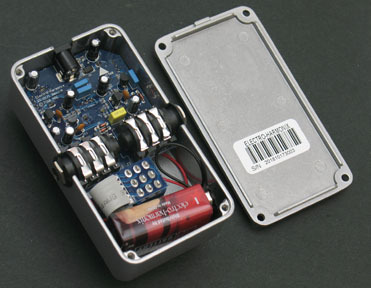 GRAPHICS AND ECLOSURE - Housed in the standard EHX nano sized cast metal enclosure, 4 3/8" (L) x 1 3/8" (W) x 2 1/8"(H). The graphics layout is slightly different than the original V1s, but the Big Muff and Pi fonts are identical to the original V1 fonts. The nickname "Triangle" has been included in the graphics. The triangular layout of the knobs, which is where the nickname for this version came from, is in reverse of the original V1. The circuit board inside is marked "est. 1968", the year Electro-Harmonix was created. 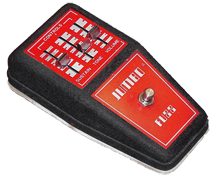 CONTROLS - Standard volume, tone, and sustain controls as on the classic Big Muff. CIRCUIT - The circuit uses through-hole style transistors, capacitors, and diodes. Resistors are small surface mount type. Transistors are BC547. PACKAGING - 2-color corrugated cardboard box. "Your original pi" is printed on the inside box lid flap. Shown above - The Triangle Big Muff circuit. Note the "est 1968" text on the pcb, the year Electro-Harmonix was founded. THE V1 REISSUE SOUND - The most difficult part of making a V1 reissue would have to be picking which circuit variant to replicate because there were so many, and many different sounds to choose from. When I compared the reissue to 6 or 7 vintage units in my collection, it sounded very different from 4 or 5 of them that had completely different circuits inside, but it sounded very similar to the rest. The V1 it sounded closest to just happens to be one of the more common 1970-71 circuit variants in my collection. It sounded almost identical to it, but slghtly brighter. Depending on what I played, sometimes I could not tell them apart. 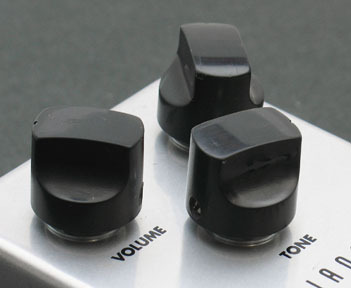 The reissue tone knob range was also basically the same as the original. Overall it is probably the loudest and most aggressive Big Muff in the EHX nano line. Compared to the Green Russian reissue and the Nano Big Muff, the Triangle has a more high gain and brighter sound, but it can also sound very smooth when the sustain is dialed down a bit, especially when using a neck pickup. It has some hefty low end, but the bass is tight, not flabby. The mids are scooped, but it has just enough mid range to stand out in a band mix nicely. 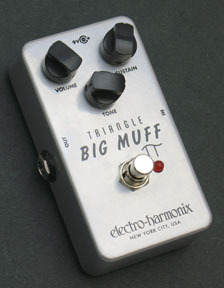 Overall EHX did a very good job of capturing the sound of the most common Triangle Big Muffs. 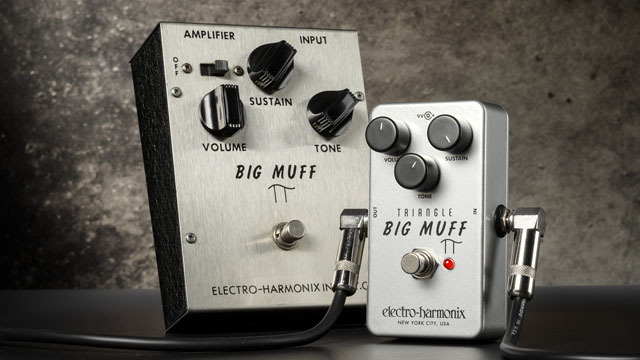 Below are some demos and comparsions to the other Electro-Harmonix nano Big Muffs, and comparisons to several vintage Triangle Big Muffs. CUSTOMIZING YOUR TRIANGLE REISSUE - Do you want more vintage-styled knobs for your Triangle reissue? 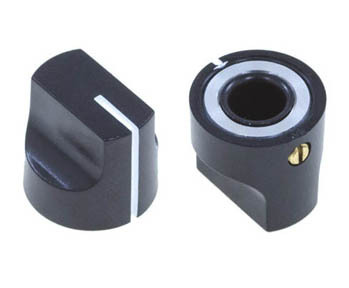 Get a set of #1611 PH-ABS Series Flared Phenolic knobs (shown below). They are close in shape to the old Daka-ware pinch knobs used on many of the original V1 Big Muffs. You can slightly modify them with a bit of fine sanding and polishing to make the shape more accurate, if desired. The bottom knob (top left photo) is an original Daka-ware pinch knob, which ocassionally turn up on ebay. Customized #1611 PH-ABS Series Flared Phenolic knobs. The bottom knob (left photo) is an original Daka-ware pinch knob, which ocassionally turn up on ebay. 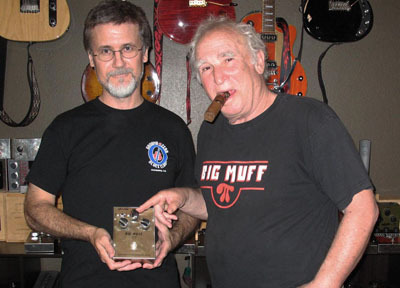 View the page about one of the first clones of the Big Muff Pi circuit made in the USA, the Jordan Creator, and one of the first Big Muff clones made in the UK, the Supa Tonebender, both circa 1973. View the page about the Italian made clone of the Big Muff circuit, the Jen Jumbo Fuzz, circa 1973. 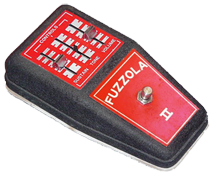 Also marketed and sold as the Jumbo Fuzz and Fuzzola II for Sam Ash, and the Dallas Arbiter Jumbo Fuzz. 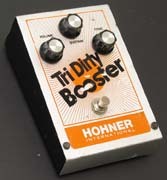 View the page about the USA made Hohner clone of the Big Muff circuit, the Tri Dirty Booster, circa 1975. 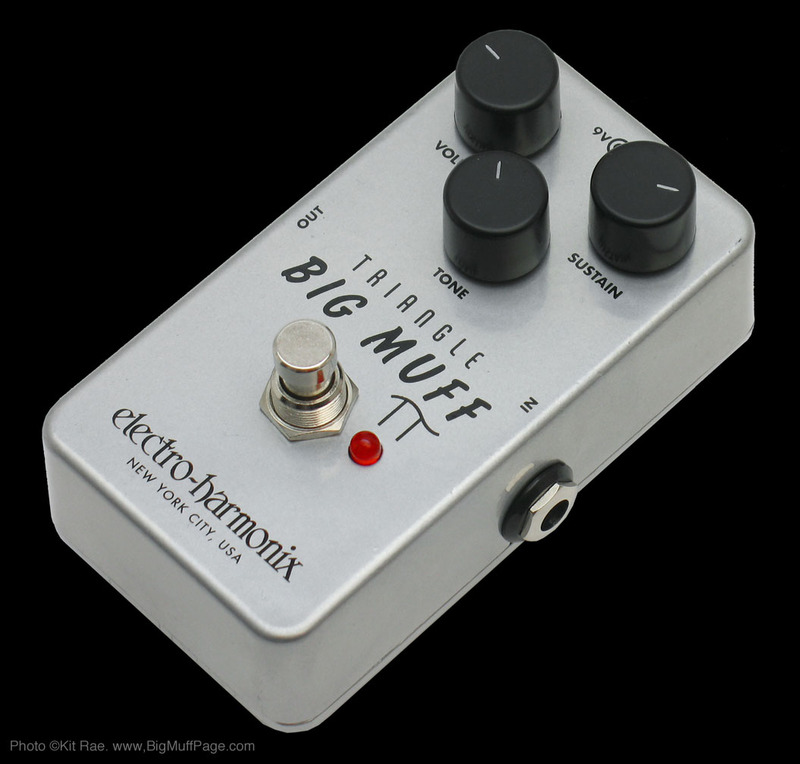 View the page about the OEM (original equipment manufacturer) versions of the V1 Traingle Big Muff. These are essentially rebranded V1 Big Muffs made for other companies, such as the Guild Foxey Lady.